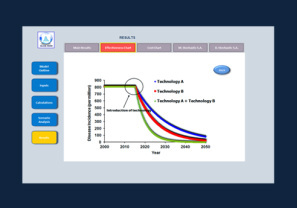 We use available biological, clinical, demographic, and socio-economic information to simulate and provide a probabilistic assessment of the potential outcomes of phase II and III clinical studies, and help determine the most appropriate size and structure of the population to be included in the study arms. We create models that simulate disease dynamics, in particular progression, evolution of demographic distribution, and (for communicable diseases) transmission across the population. For instance, this type of models can be very valuable to plan and forecast the impact of a vaccination campaign, at the population level. Dynamical models are typically implemented using individual (agent) based stochastic simulations or using systems of deterministic ordinary differential equations. Our models account for differences in demographic, biological, and socio-economic factors, and for different levels of contact (mixing) within the population. As an example, these features can greatly influence the decision on who and how frequently should be vaccinated or administered drugs, when vaccination or treatment is targeted to high-risk groups in a given population. Our dynamical models can be used (ex-ante) to forecast outcomes and guide design, and (ex-post) to analyze and evaluate the impact of a specific health intervention, or of bundles of interventions, implemented within a health program. In addition, we work on multi-scale stochastic models that can be used to simulate critical terminal phases of infectious disease eradication campaigns, and on new models that, combining insights from evolutionary biology and sociology, account for the impact of urbanization on risk factors and dynamics of communicable and non-communicable diseases.